The KONG Floppy Knots are cheerful, soft toys with a knotted rope and squeakers on the inside. These flexible toys stimulate your dog's hunting and playing instincts. Available in two sizes and four different figures: elephant, fox, hippo and rabbit. Squeaking, various structure, knotted rope, elastic design, the Floppy Knots from KONG have it all. 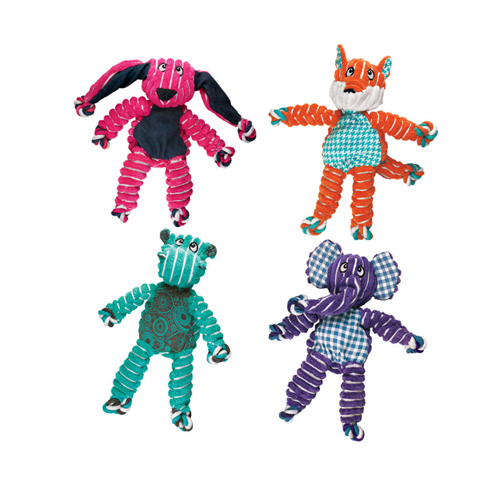 These cute cuddly toys look like zoo animals on the outside, but have a strong, knotted rope on the inside. The various structures, squeaking sounds and the jumpy design stimulate the hunting and playing instincts of your dog. Have you used KONG Floppy Knots before? Let us know what you think about this product.